While most lagers give away most of their taste profile in the front of the mouth, Pilsner Urquell only hints at its flavour there. Instead, it develops in the middle, followed by a refreshing, clean finish and balanced aftertaste, practically inviting you to have another. I drank this in Tankovnas in Praha. I'm struggling to adjust to life back here in the states. It is an endless quest to find an unfiltered 4.0-4.5 pilsener here that doesn't taste like Seltzer water with rye bread passed over it! Amazing beer. The only one better was Staropramen. great beer for a hot day or after a workout. I enjoy the aroma and the bitterness, and a good clean finish. Couldn't find in cans, settled for brown bottle. Best by date of September 2019 (today is April 13), so figured it was reasonably fresh, considering the distance traveled from package to store. Definitely tastes skunky, although the longer I let it sit, the less it tastes that way. Biscuits and cracker flavors, delicious, but can't get past original taste. Hopefully will find on tap. I have much respect for this beer. The first pilsner ever created. It stands the test of time. Look: Pours a beautiful clear, golden color with minimal to moderate head. Aroma: Aroma of noble hops followed by a pale cracker and crushed grain malt aroma. There is a slight sweaty, buttery, and earthy funk, possibly from the hop aroma mixing with the diacetyl. Flavor: Initially, flavors of munich malts with a pale, bready, cracker, and grainy flavor and sweetness. This is followed by a hop bitterness that cleans the palate and finishes completely dry. As the beer warms, yes there is a buttery flavor midway with the malts from the diacetyl, however it is more apparent in the aroma. Feel: Finishes crisp and clean. A bitter hop astringency is left on the tongue. Could use a little more carbonation. Drinks similar to a light lager. Overall: An excellent beer. A strong delicious pale Munich malt profile balanced by a hop bitterness into a dry finish. All with the characteristic buttery profile. It's similar to a German pilsner with a buttery flare. A classic. Pours a bright golden color. Completely lear and effervescent. Thick pillowy white head collapses downward leaving sticky white lacing on the glass and a thin layer of white foam on top of the beer. Remains effervescent. Aroma has notes of sweet bready malts, hints of grassy hops and a light fruity - apricot or apple-y - note. Floral grassy hop notes come through on the back end. Taste follows the nose with notes of malts, bread, light honey notes, with some slight buttery notes. Grassy bitter hops come through on the back end. Lingering bitterness remains on the palate. Feel is light and crisp with a lively carbonation. Overall a lovely Bohemian pilsner and one that I pretty much always have in my fridge. Looks great in the glass, a clear, dark blonde, bubbles constantly rising from the bottom of the glass, resists a thin head with nice lacing in the glass. Smells of sourdough bread, toast with apricot jam, barnyard, subtle hop bitterness. Smooth body, a bit thin, pale bitterness on the tongue, clings to the mouth on the aftertaste. Classic, easy drinker. Love this beer! Had it in a 16 ounce can served ice cold! As a beer that serves as the baseline/original for Pilsner beer it’s right where it should be. The look is spot on. Aroma is clearly European and reminds me of my years living in Germany. Taste has a good bitterness with acceptable sulfur notes that might be off putting to someone new to beer but perhaps more enjoyable to the experienced beer drinker. The mouth feel is smooth. 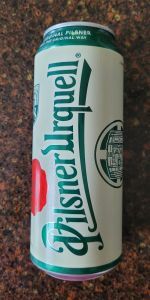 This is a great one to enjoy on a hot summer day and has much more flavor than typical cheap American “Pilsner” beers.